We’ve all been taught to go out and find work, but sooner than you think, more of us are going to have to create our own work. 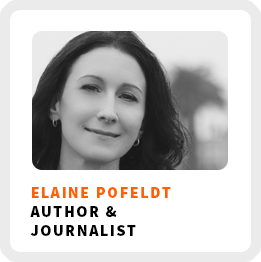 Elaine Pofeldt shares how to create your own work that works for you by aligning new opportunities that you are uniquely suited to your skills and your personality. She’s the author of The Million-Dollar, One-Person Business. She was inspired to write the book after seeing an uptick in the number of one-person business making over a million dollars. In fact, that number has increased by 33% since 2011 and she wanted to know why. How Elaine made her own pivot into becoming a freelance writer. If you want flexibility you have to have a plan. How the million-dollar one-person business owner thinks and works differently than the average freelancer. Why you shouldn’t only rely on income from your traditional job. Six primary categories of successful businesses that lend themselves to million-dollar one-person businesses.